You know that universal (or maybe I just think it's universal because my children go to the preschool that I went to...) craft that children do when they're little? Or some variation on the same. You know... it's so cute. But, for the most part, I'm not too nostalgic about feet and their prints. On the second Sunday of each month, our church has a potluck meal after Church. Everyone brings a dish or three and we all feast together. The only thing missing is the wine. Anyway, today was the day for that fellowship meal. I made this chocolatepuddingpearcake inspired by a Nigella Lawson recipe in what I think is my favorite book of hers, Nigella Express. I also feel like I've said that somewhere else before - the bubba gump thing. So, when I see a recipe that calls for pears, I almost always have to try it. In fact, one of my favorite soups is a Roasted Red Bell Pepper soup....and it has pears in it. And you get this awesome hint of pearness....and sing hallelujahs. Anyway, so I made this cake. And it was kind of gorgeous. A lot of cakes aren't that pretty - and they don't have to be. 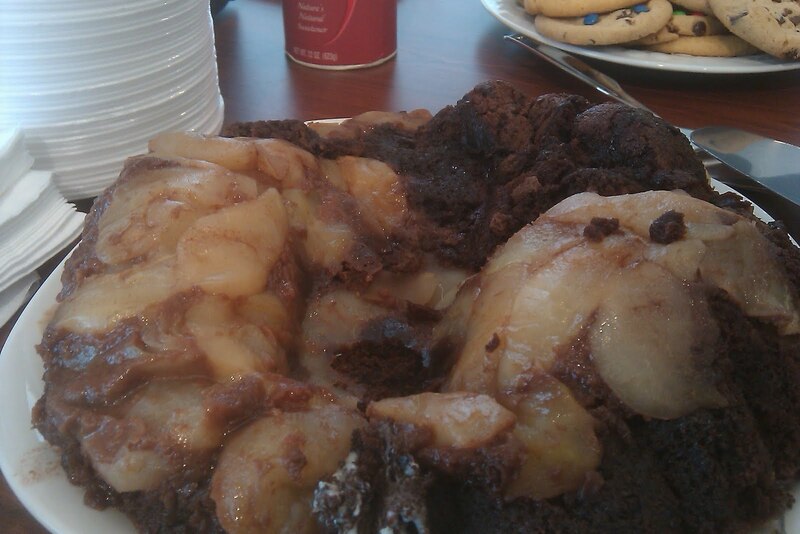 But this was in a bunt pan and topped with all of these beautiful pears and drizzled with chocolate sauce. And then I gingerly spread a double layer of aluminum foil on top of it. And put it in the van to go to church. And we got to church. And he got all excited about being at church, and hopped out of the car. Placing his left, sandled, dirty-despite-having-been-showered-less-than-an-hour-before-hand, stinky, pitter pattering foot directly in the middle of my pride-inducing cake. God was with us and the foil didn't break, so my frustration and annoyance gave way to laughter almost immediately. If the foil had broken, well, worship might have been difficult. And all of the people at church, especially moms of little boys, laughed a lot. A whole lot. And one sweet, wise woman said, "Ann Lowrey - if you don't have a name for your cake yet, I believe you do now..."
Two hours before you want to make the cake remove from the fridge your eggs and butter. You can go ahead and put the butter into the bowl of the food processor and let it do its softening there - it's easier to unwrap cold butter than it is soft butter. Also, if you have a gas stove, put your eggs under one of the eye covers (heavens - don't accidentally turn it on) - this is the best way to keep them from rolling off your counter and causing curse word temptation. Nothing like an egg rolling onto the floor to get me to mutter four letters. or twelve. 3 pears, peeled and sliced. If you do want it to be beautiful, then let it get completely done, which shouldn't take longer than 45 minutes. Let cool in pan for 10 minutes. Flip out onto a cake plate and drizzle with warm chocolate sauce - homemade or store bought. Imagine a little footprint in it - with all of Eason's love. [On the way home from church the 83% eaten cake was again on the floorboard. And we pulled up in the driveway. And Eason unstrapped. And hopped out of the car. And put his right, bare, dirty-despite-having-been-showered-less-than-four-hours-before-hand, stinky, pitter pattering foot right in the middle of the remaining three servings of cake.